Posted July 16th, 2012 by Adam & filed under Codastar News. So what affect do reviews have on our online marketing? Put simply, probably more than you’d think! Reviews are one of the best ways to increase your local search rankings, and not surprisingly, a little hard to come by. We all know far too well (and we’re probably guilty of it ourselves!) that when we receive good service, we talk about it moderately, but when its bad we tell the world! Unlike other black-hat-type marketing methods, reviews are a little harder to duplicate and create falsely – leaving it a ‘truer’ reflection of your business and company than other areas of search. Its this genuine online picture that makes reviews so crucial to your marketing strategy. How can I encourage people to give us reviews? Be careful how you publicise review-giving, as of course, Google Towers have outlined some very clear “dos and dont’s” for the whole affair. Offering incentives and discounts for reviews is highly frowned upon (Google Towers coining it a ‘conflict of interest‘) and if offered could result in some rather severe search penalties from the engine. Use your social media channels to contact those that already have experience with your brand/business and ask to leave a review. Use e-marketing lists, or – if you still do – the traditional flyer/snail mail approach. Remember to use QR codes for easy linking and page finding. Put a call to action (and link) asking for reviews on your website/landing pages. Display signs and/or flyers by the cash register/til in store, or offer details with receipts on completion of a meal/visit. With all these tips, make sure that you make the process as easy as possible, providing a link to your places page and an overview of how to give a review. Of course, to save time – link to us and use our walk-through below to make things super simple! How do I give out reviews, and how do others review us? 1. Type into Google main search the local business and their location that you are looking for. Within the search results, there will be a ‘map’ result – if you click on the main link it takes you to the home/landing page. Click on the ‘x Google Reviews’ section. This will take you straight to the business Google Local page. 2. Once clicked, you should arrive at the page below. Click on ‘write review’, and a little pop up from our friends at Google advise you that all reviews and associated photos are visible to everyone online under your name, with a little ‘show example’ click through too. 3. Once you have clicked on ‘write review’ you are brought to another pop up box, giving you ratings from 0-3 (poor to excellent) with an extra box to write anything additional you wish to add. Once this is complete, click publish! You’ll be offered the option to share with your circles and friends, and congratulations, you have completed a Google Local Review! 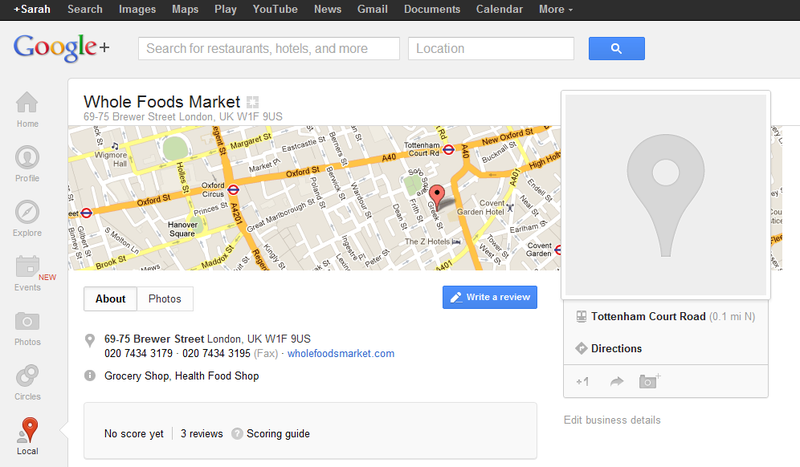 For help setting up your Google Local Page, check out our walk through guide here.